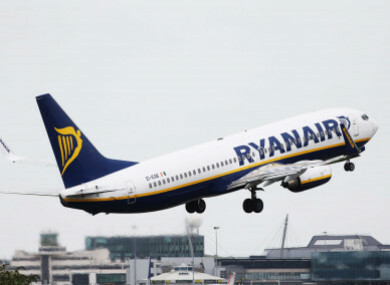 RYANAIR HAS ANNOUNCED it is to charge people to bring small luggage on board its flights. The airline said that from November, travellers will be charged between €6 and €10 to bring a large bag with them onto the aircraft. The new measures mean that people who buy a standard Ryanair fare will be allowed to bring on one “small personal bag”. Kenny Jacobs, Ryanair’s Chief Marketing Officer said: “From November 2018, we are introducing a new lower cost 10kg checked bag and changing our carry-on bag policy to eliminate boarding/flight delays. “Priority Boarding customers will continue to enjoy two free carry-on bags. “All other (non-priority) customers will be allowed one free (small) carry-on bag, and those who wish to check in a second bigger 10kg bag can do from €/£8 at the time of booking. “This new policy will speed up the boarding and cut flight delays. Email “Ryanair to charge passengers between €6 and €10 for carry on luggage”. Feedback on “Ryanair to charge passengers between €6 and €10 for carry on luggage”.